Coupons.com just loaded and reloaded more game coupons. Target is having a game sale this week. 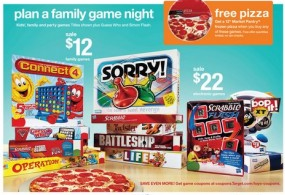 Many Hasbro games are on sale for $12 making them $7-9 after coupon. Plus you get a FREE Market Pantry Frozen Pizza when you buy one game!